Early in the week Their Majesties made their devotions, and their example was followed by some members of the suite. An atmosphere of calm and genuine religious reflection reigned over the small and intimate church of the Livadia Palace all week long. Their Majesties prayed with a rare fervor. They took communion on Holy Thursday. Before communion, the Emperor and Empress made a deep bow to all those in attendance, as was the Russian custom, the Empress would on that day, humbly ask pardon from all Christians, offering them her hand as a sign of reconciliation. Having the Empress genuinely contrite and asking pardon from others was shocking for many people to see. 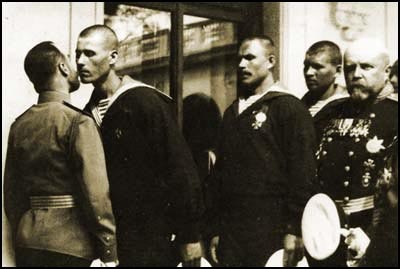 Watching this old Russian custom always left those in attendance with a profound impression. On Easter, in the morning, at the Palace, they held the traditional ceremony of the Easter kiss with the Emperor. The Emperor was under the colonnade in the Moorish courtyard, standing beside the Empress, seated in an armchair. Their Majesties were surrounded by their children. Each member of the Suite, household, staff and men of the guard and from the Standardt would line up and each in their turn (and there would be a huge number of them!) would shake hands with the Emperor, receive the traditional "three kisses" of Easter from him and exchange with Nicholas the traditional greeting "Khristos Voskres" (Christ is Risen) and the Emperor would reply "Boyistenu Voskres" (Truly He is Risen). They would also exchange these greetings with and be offered the hand of the Empress. Gifts of eggs would be given to those in attendance handed out by the Imperial children. The specific gift usually depending upon the recipeint's rank and nobility. 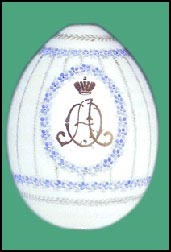 Senior members of the household and of the Nobility might receive small gold and enamel or precious stone egg pendants, others would receive beautiful porcelain eggs from the Imperial Porcelain Factory, bearing the cyrillic XB ("Khristos Voskres") on one side and on the other side the Imperial Cypher of Nicholas, Alexandra, seen here, or one of the Grand Duchesses, all suspended on beautiful colored silk ribbons. Given the huge number of people to be received, this would last for hours. The family and Suite would then have their Easter supper later in the day. Immediately after Easter Sunday, many guests, consisting of their family and friends, would arrive at Livadia and the 'season' in the Crimea, of the Balls, parties and entertainments would begin. This description is largely based on the first hand account of Easter 1912 at Livadia, written by Alexander Spridovitch in his memoirs. A comparison showing how GEDmatch and ancestry.com display there information in different ways and how they interprete your DNA results.